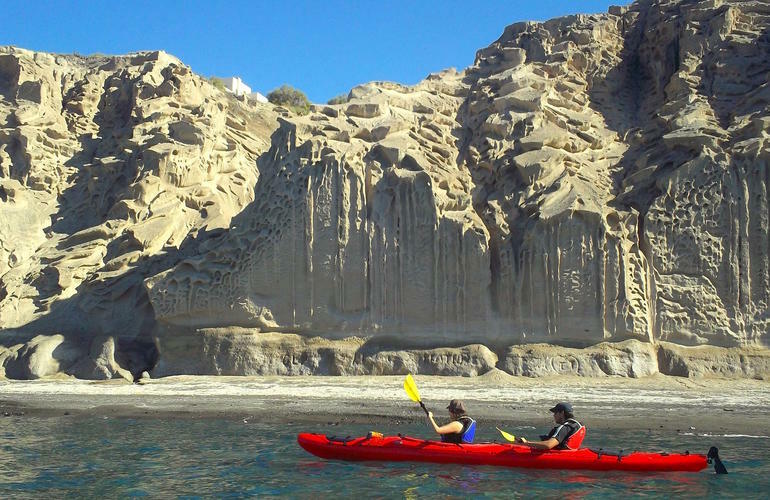 Sea kayaking in Santorini is an unforgettable experience that one should do while visiting Santorini. 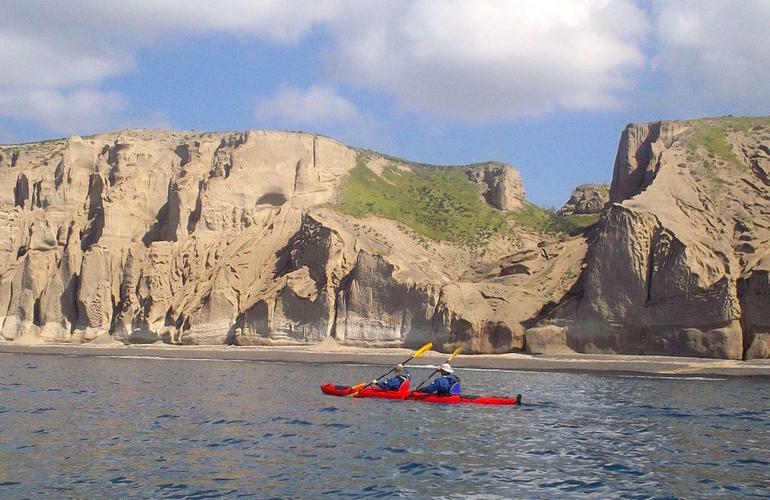 While kayaking with this guided tour in the southern coast, you will have the chance to take unique views to the Caldera and the volcano. 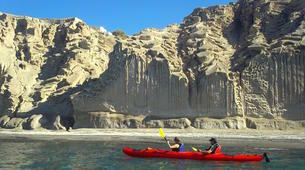 The experienced guides of "Santorini Sea Kayak" will give you a resourceful tour of the island. 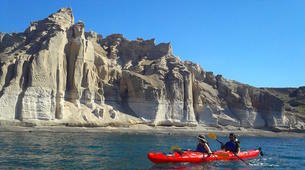 With the sea kayak guided excursion you have two options : either you can have it in the morning and enjoy the whitewashed houses and the extreme rock formations on the daylight, or at sunset to see the red sun setting in the afternoon and reflecting the blood-red colour on the surface of the sea. 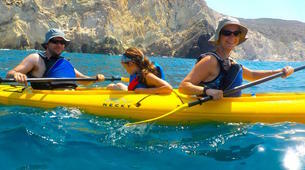 Before going in water you will have an introductory course to sea kayaking by your guide to learn how to paddle effortless. 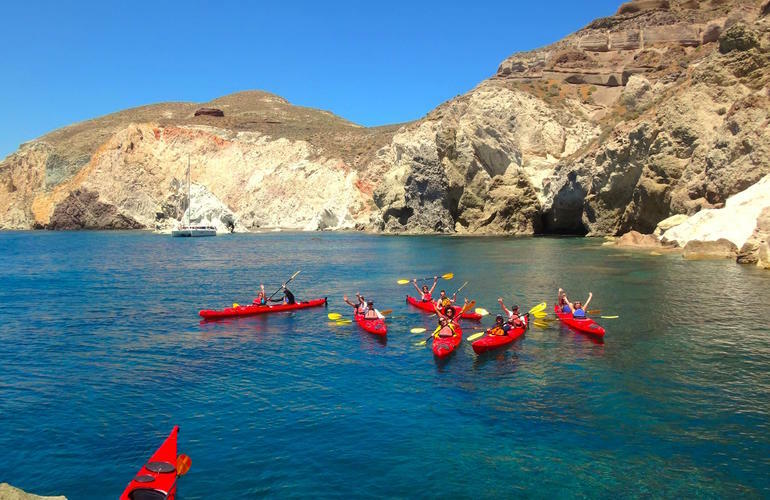 Once you have mastered the art of sea kayaking you will enjoy paddling around the southern coast, swimming and snorkeling in the blue crystal clear waters of Santorini. 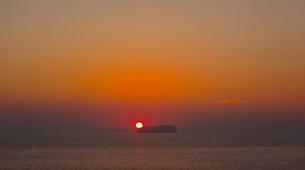 -You will stop at Kambia beach for snorkeling and a light picnic. This is a great company. The entire process was well organized. The booking was easily done online with continued communication prior to the event. The transportation to and from our hotel was arranged (and was very punctual) through the company. Our tour guide, George, was great...fun, entertaining, knowledgeable!! A delicious lunch was provided with several options. There was even time for swimming and snorkeling. Just an all around great, active day in this beautiful setting!! 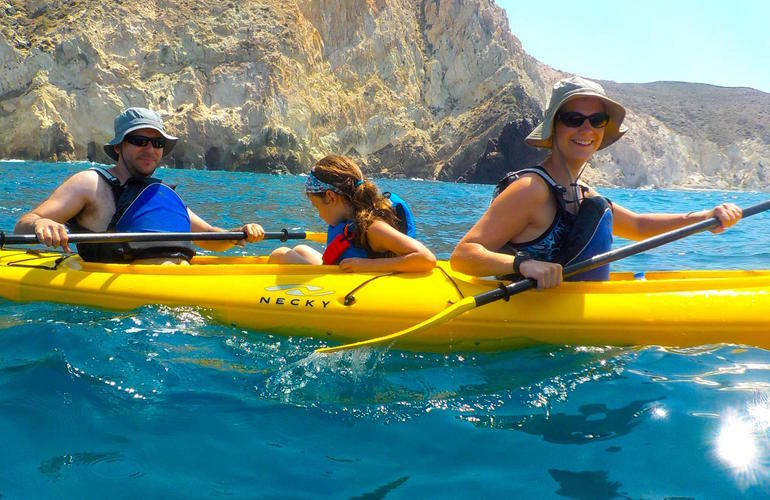 We are so happy that we did this kayaking tour with George. 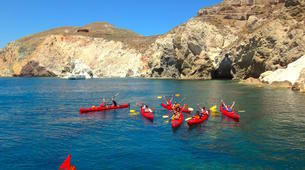 This company is well-organized, the views are spectacular, the tour guide was amazing, and lunch was great too. 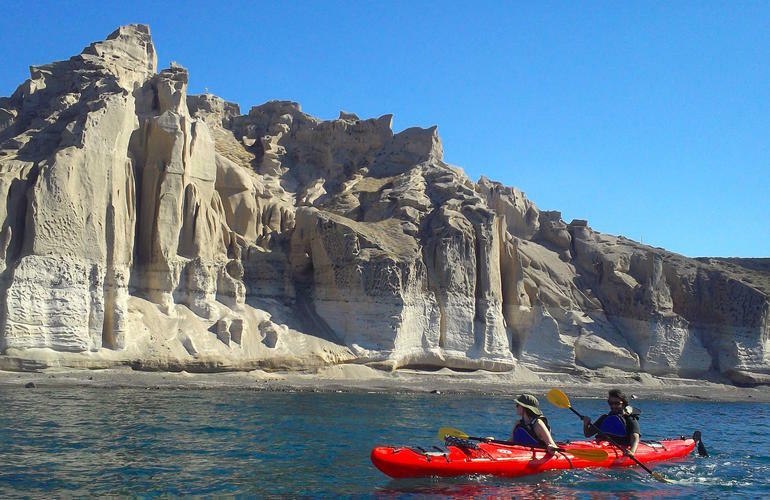 To top it all off our tour guide George took amazing pictures as we were kayaking. 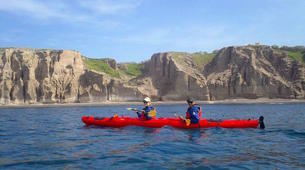 As first-time kayakers this was an amazing experience. 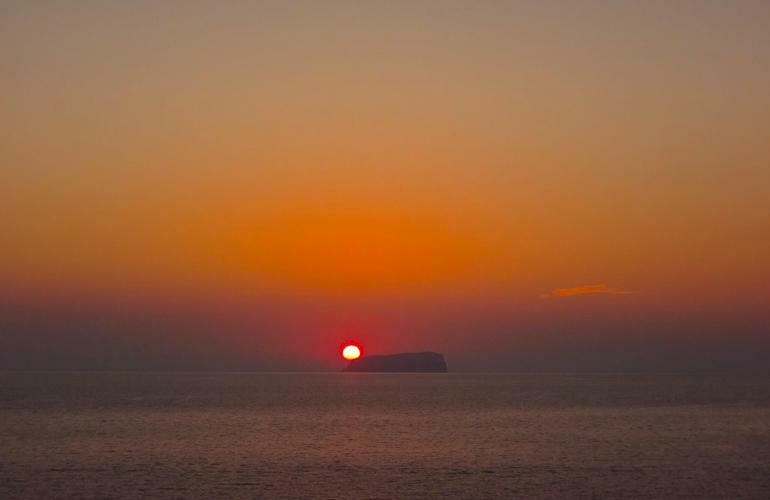 We can't wait to do it again when we come back to Santorini. 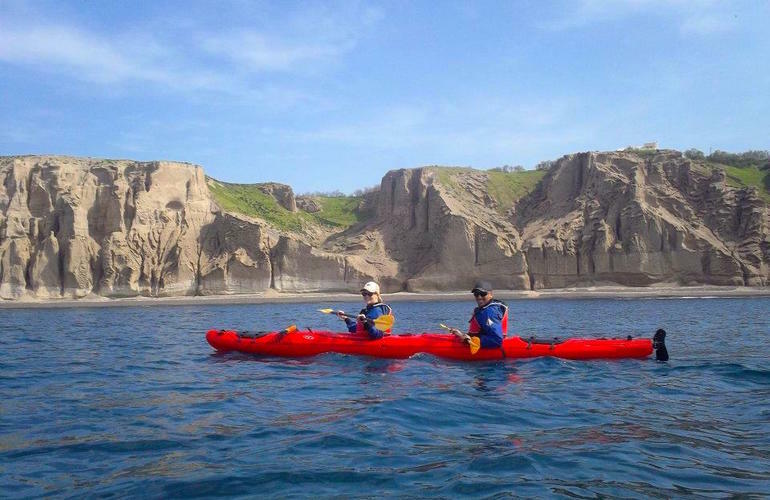 It was an easy to paddle and very safe boat.Equipment was good.Its not a serious paddling event and not very challenging,but it accommodates all levels of fitness and ability.You really do not have to have previous experience. 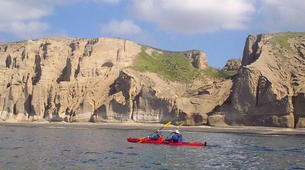 The kyaking was fun, easy and safe. Snorkelling was good and the picnic was so yummy. Very friendly and funny staff, amazing experience, great equipment (including hats lol), very tasty lunch and good pictures. Thank you!